There was a strange feeling on the train, jubilant and alcohol-fueled, that we just couldn’t put our finger on. And then we remembered. 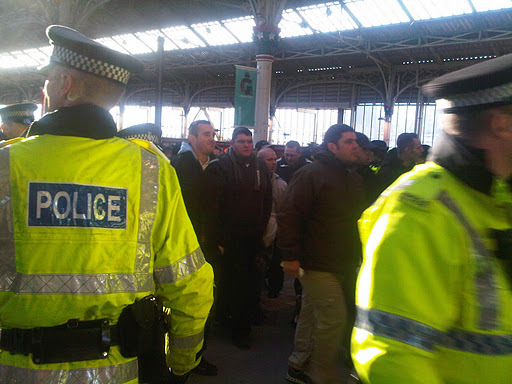 The EDL were in Preston. When we go to the station we were surprised, annoyed even, to see them lighting up within the building. I asked the police why they weren’t doing anything about it, but they said it was the least of their worries. Oh.. right. We were even more shocked, however, when we saw them being led outside to buses waiting for them to be taken to the start of their protest. Is this not something of an endorsement? 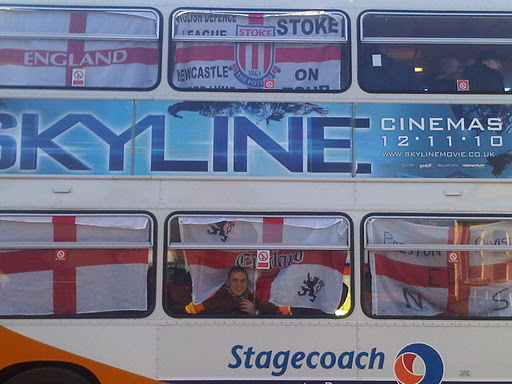 Toilets had been set-up to prevent any little accidents on public property, and the only arrests made were of EDL supporters,for being drunk and disorderly. This entry was posted in Uncategorized on October 27, 2010 by kirstystyles1. Super villain Mahmoud Amadinejad, President of Iran took to the stage at the UN summit in New York – but what did we hear? The US delegation walked out. European countries followed. Newspapers heard ‘9/11 was an inside job’– the easy headline, and the news desk knock off early. “He would say that,” we all agree, and duly switch off. The US and UK pride themselves on freedom of speech. I disapprove of what you say, but I will defend to the death your right to say it. So why do we all ignore him so compliantly? Ahmadinejad outlined some concerns, “family crises, security… world economy, climate change… the aspiration for justice and lasting peace”, concerns like any Western leader. On nuclear proliferation, a sore topic, he says nuclear energy would give Iran a cleaner and cheaper alternative to fossil fuels. Although allowed under the UN Non-Proliferation Treaty (NPT) he argues the Security Council “have equated nuclear energy with the nuclear bomb, and have distanced this energy from the reach of most nations”. While at the same time these members expand their arsenals despite the NPT prohibiting stockpiling of arms and calling for disarmament. Like 9/11truth.org, a non-profit whose views Time Magazine called “a mainstream political reality”, Ahmadinejad asked for a UN inquiry into 9/11. He queried why one wasn’t done immediately and then according to the outcome, measures could be taken against the wrongdoer. Where one turns off, and how the media summed up the speech was with his claim that most people agree that 9/11 was orchestrated by the government, to invigorate America’s economy and strengthen Israel. Another viewpoint he says, advocated by American statesmen is that a sophisticated terror network executed the attacks. It is undeniably this that most people believe. In light of that, he questioned the rationale of a “classic war” that led to hundreds of thousands of deaths if it is not a classic threat. 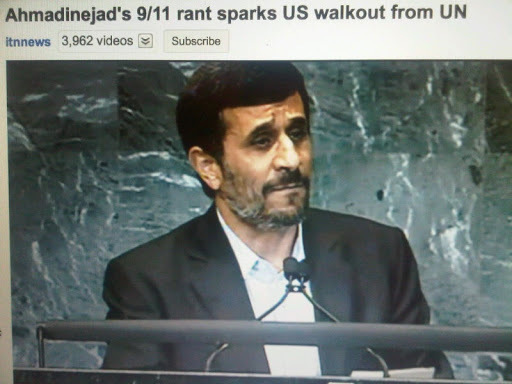 Look back at the title of this blog, these are words taken from Ahmadinejad’s speech. He offered to hold a conference in Tehran next year about terrorism and how to confront it and proposed that 2011 should be the year of nuclear disarmament. Why don’t we jump at the chance to get a Muslim insight into motivations for terrorism? And why shouldn’t 2011 be the year of nuclear disarmament? “Nuclear energy for all, nuclear weapons for none” he said. Let’s take up his offers, and then if he falters, we can with authority do what many people do as soon as he starts to speak. I was not surprised that our flat-capped ‘friends’ at Tetleys, whose parent company Tata have been accused of human rights violations relating to a factory death, have ‘distanced themselves’ from blame. Like BP over the summer, someone else was making the calls, none of the tea made in this factory tainted British tea cups. Just so long as nobody’s blood went into my drink, carry on. For what I’m sure is monotonous work, and the death from suspected poisoning confirms it is dangerous, workers only get paid 8p a day. And I suppose the company did not know this either. Two more workers died during subsequent protests. Names we should be proud of exploit labour to keep prices low in the UK, while keeping their hands far enough away that if anything happens, “we didn’t know anything about it”. For the full text of Ahmadinejad’s speech, with more of his interesting assessments of the world de facto go to http://tinyurl.com/3yo6rwk. This entry was posted in ahmadinejad, arms, Iran, security council, United Nations, United States on October 5, 2010 by kirstystyles1.